Fall migration is a great time of year and it's also a horrible time of year, at least when talking about the casualties from birds colliding with windows. But this time, the same sad story we repeatedly tell has a happier ending. The simple fact is that birds do not see the same way that we do. Glass and windows can either be invisible to birds when it's a hallway with windows on both sides or an illusion, when all they see is nature reflecting. Besides, I'm pretty sure we've all seen a human walk into a glass door anyway. Birds fly into glass and die. Some times they bounce off and may fly away only to pass hours later. Hopefully a few manage to go off and live their birdy lives. 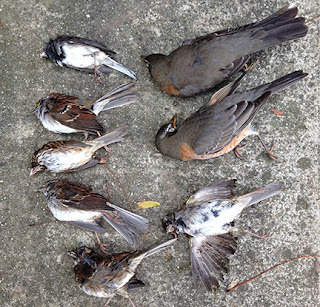 Estimates about how many birds die from window collisions every year around the world range up to the billions. There have been lots of changes to West Campus over the past 10 years and some of the methods we used to prevent birds from flying into the glass at the Collection Studies Center are no longer appropriate. So while we continue to search for a more permanent, continuous, economical, sustainable solution to the problem, this is what we have done and it's working. 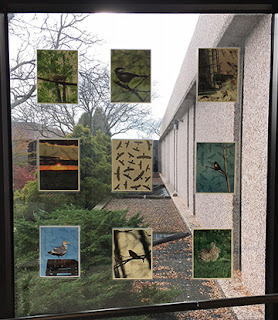 Thanks to support from CSC administration, IPCH, and the Yale Peabody Museum, WC birders have installed laminated photographs along the most deadly windows in the building. The sheets have nature images (mostly birds) on one side and various bird silhouettes on the other to create a pattern to break up reflections. The laminated sheets can be temporarily put up during peak migration and be reused!!! While there are some issues with an installation like this to deter collisions, it seems to be working quite well. The silhouettes sides are mostly facing out to break up the reflections, the tree in the window is still a reflection. 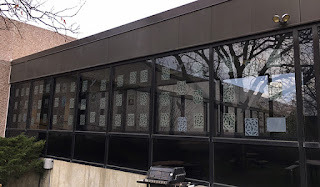 In the seven days leading up to the photos going on the windows we had 15 dead birds along these windows.... 15!! That's more than 2 per day. And since the photos have been up.... no photo because no dead birds! While this is fantastic news, there are still other places on West Campus that still have high collision rates. 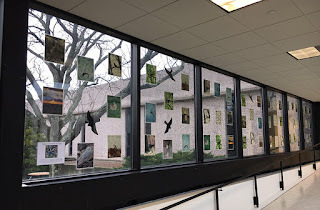 But we are super excited in the CSC that we are able to find ways to be environmental ambassadors to our avian co-habitators and are excited to look for methods to remedy this problem around campus. View from inside. The corridor is no longer see (or fly) through. A special shout out to Beth Bolen and Laurie Batza for all their support with this. 0 birds in 7 days. Keep the good news coming and thanks for all the positive comments!! !